We have been consistent reporting an accurate view of the Tallahassee real estate market, which means that most of our reports over the past 4+ years have not been so wonderful. But lately, there are signs that the housing market bottom might be near, as many of the leading indicators that we track are turning positive. 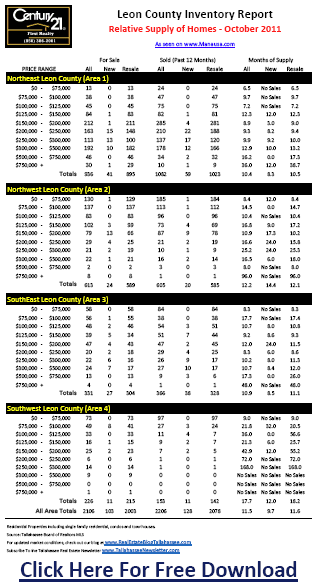 First of all, you can review the most recent Tallahassee Housing Report (which was published this morning) showing the relative supply of homes for sale in the Tallahassee real estate market is falling again. Decreasing our inventory is very important, as home values will continue to decline so long as the inventory outweighs current demand. While our current supply and demand report does not include a reference to the shadow inventory of homes, you might recall that we recently reported that the number of homes in the shadow inventory is declining as well. Nearly every report that we maintain on supply and demand in the Tallahassee real estate market shows positive news on the supply side. And yet another bit of positive news, in case you did not catch it on the Tallahassee REALTORS® Blog, 11 of our super real estate agents at Joe Manausa Real Estate maintained or grew their business over the past year. While that feat might sound extraordinary, you should know the bigger picture! The number of home sales in the Tallahassee real estate market declined over the past year by 9.8%, yet these 11 real estate superstars were able to defy the market and increase their performance over the previous year. Now let's put that into perspective shall we? A total of 840 Tallahassee Realtors participated in a sale over the past year, and 53% of them saw their sales decline from the previous year. 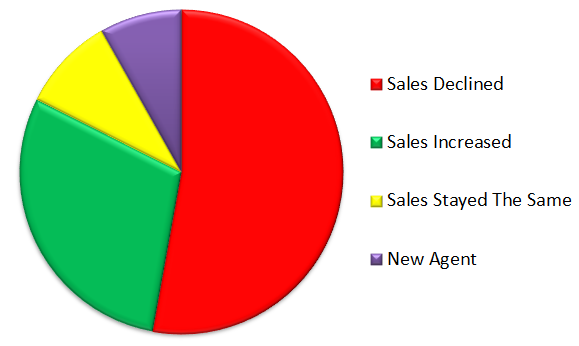 Less than one in three saw their sales increase, and 8% were sold by agents in their first year in the business. Joe Manausa Real Estate had zero agents whose business declined during that period of time. Well done team! I am very proud of the full-time, professional REALTORS here at Joe Manausa Real Estate and look forward to working with them every day. Even during these difficult times, we are finding new ways to improve upon our service to our customers and the results speak for themselves. We are looking to add two more agents to our team, so if you or somebody you know might be interested in a career in real estate, please have them contact us for a confidential interview. We have helped many people get started fast in real estate, and we are looking to do it again today.